Eurogenes Blog: Following the mammoth herds? The recent Qiaomei Fu et al. paper on the population genomics of Ice Age Europe was a fascinating read, but its sampling strategy left a big blind spot: Eastern Europe 24-34 kyr BP. Check out what happens to the maternal lineages of Eastern European mammoths at this time. Basically, they're replaced by lineages native to North America. During the 14-24 kyr BP period, the rest of the European mammoth population is also affected. 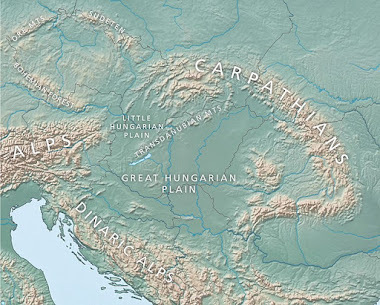 Of course, this is also precisely the period when the so called Villabruna hunter-gatherer cluster appears in Central Europe, probably as a result of mixture between the remnants of post-Ice Age Europeans and a population relatively closely related to Caucasus and Siberian hunter-gatherers (see post and discussion here). Perhaps mammoth hunters? No wonder then, that this is also the time when we see the first appearance of Y-chromosome haplogroup R1 in Europe; more precisely R1b1, in the ~14 kyr cal BP genome from Villabruna, northeast Italy, that defines the Villabruna cluster. After all, R is the sister clade of Q, the dominant Y-chromosome haplogroup in many parts of North Asia and the Americas. Im a little confused as to why the paper by Fu distinctly states that the new input is a something within the Vestonice-Kostenki (ie European UP) clade, to which MA-1/ Afantova is an outgroup to ? They really missed something with their modeling. They got Satsurblia more or less correct; a mix of Basal Eurasian + something related to MA1. But they failed to really nail that this something related to MA1 was also related to Villabruna, or in fact the same thing. Very likely this theory fits with the separation between R1b1-L389- in Central Asia and after to India and R1b1-L389+ to Western Europe(certainly some samples 14000 ya in Italy but perhaps also elsewhere). The age of separation would be around 17000 years ago as to YFull. Those mammoth maps are nice. However, AFAIK, the Dolomites including Villabruna, and the Glacial Northern Adriatic Plain in general were never populated by mammoths (which is what the maps say as well). Moreover, if the maps provide a reasonable idea of mammoth density, mammoth hunters 24-14ky ago had good reasons to settle Beringia and Alaska, but there was little mammoth population to follow into Central Europe. That's not to say that R1b didn't originate quite a bit NE of the Veneto. However, the reason it came there was most likely not mammoths. Otherwise, the Villabruna people had focused on heavy spears, instead of inventing bow and arrow, and most likely* learning how to use dogs to retrieve wounded small prey. * AFAIK, there isn't any respective evidence from N. Italy yet, but for the Ahrensburgian, and from Star Carr, Yorkshire. Humans hunted and followed mammoths, bison, horses, antelopes, and other large mammals on the steppes. It looks like Ust-Ishim's close cousins were already going after mammoths way up north. Hm, interestingly samples from Sunghir, Russia, 30 000 years old, represent exactly this time period and region, and are studied by Pinhasi's team. "That's not to say that R1b didn't originate quite a bit NE of the Veneto. However, the reason it came there was most likely not mammoths." 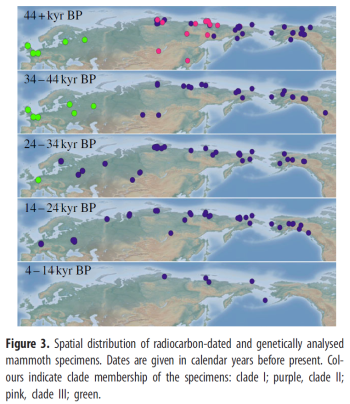 Maybe inversely - mammoth seemingly going extinct west of the Urals? There must be a reason why the mammoths moved west. Whether people followed the mammoths specifically isn't important. They may have moved west for the same reason, or followed other animals that moved west for the same reason that the mammoths did. "Furthermore, our data show that the geographical distribution of clade I continued to expand westwards, reaching European Russia at ca 32 kyr BP (figure 3). This first appearance of mammoths carrying mtDNA clade I in Europe appears to coincide with the disappearance of the endemic population in Europe (carrying mtDNA clade III) at ca 34 kyr BP (figure 3). However, in contrast to the genetic turnover in northeast Siberia, there is no evidence for a temporal overlap between clades I and III in Europe, which could indicate that the European population became extinct, and that Europe subsequently was recolonized by Siberian mammoths carrying clade I"
This extinction would be early enough that present AMH's would predate Villabruna cluster, and probably be I and C FWIW. But then again so were most Villabruna cluster men. We don't know who was in Eastern Europe just after the Siberian mammoths moved in there, because Eastern Europe wasn't sampled for this time frame. When (and where) are the Iberian BB samples you referred to from? The entry of Siberian mammoths into Eastern Europe was during the 24-34 kyr BP period. Who was in Eastern Europe at the time? Did some of them come from Siberia? How do we know if there are no samples? The Siberian mammoths entered the rest of Europe during the 14-24 kyr BP period. This is when Villabruna eventually forms. I was imagining that if the western mammoths went extinct some of the people who hunted them might have drifted south looking for a new niche? If there was a y line coming from Northeast Asia with mammoths to Europe, I would claim that it was Q. Check yfull and Q-M930 (above Q-L804). Q-M930 formed 16200 ybp, and its TMRCA is 15000 ybp. Q-L804 is a brother clade of Q-M3, and it is today mainly found in northwest Europe. There are also other Q lines that are suitable for Siberian gene flow to Europe, e.g. Q-M25. We know that Q-M25 was in Altai during Karasuk period. Q-M25 is also found in Europe and Caucasus. It formed 23900 ybp, TMRCA 16700 ybp. On the other hand, Q-L56 formed 26100 ybp, TMRCA 19900 ybp, and its subclades Q-L940 and Q-L53 are both found in Europe. Q-L53 formed 19900 ybp, and its TMRCA is 16200 ybp. Q-L940 formed 18800 ybp, TMRCA 16100 ybp. If I am right, we do not have any ancient R1b in Siberia, but several Q samples from Altai, North Asia and America. Rumor is Max planck institute is about to make it public. Oh, And I am betting those 11 bell Paris sample will turn out pretty R1b (M269) and even some E1b-M81...who wants to bet. Further I will be on the look out for a single, single is enough, H2a or H13. You don't think some of those mammoth sites in Asia might be in RQ territory? Why only Q, and why migrations from all the way in Northeast Asia? I reckon maybe one R1b, and possibly not M269 at that. Keep in mind that these results have been known to the people at Harvard and Max Planck for while. In other words, basically the same people who put out the Ice Age paper, and yet in that paper they reiterate that despite the discovery of the Villabruna R1b, M269 probably spread across Europe from the steppe. My understanding is that the people of Villabruna and nearby regions of S France and Iberia hunted small game---roe deer, etc...as evidenced by the presence of microliths. Others, much further north may have hunted mammoths at this time of relative climatic amelioration. 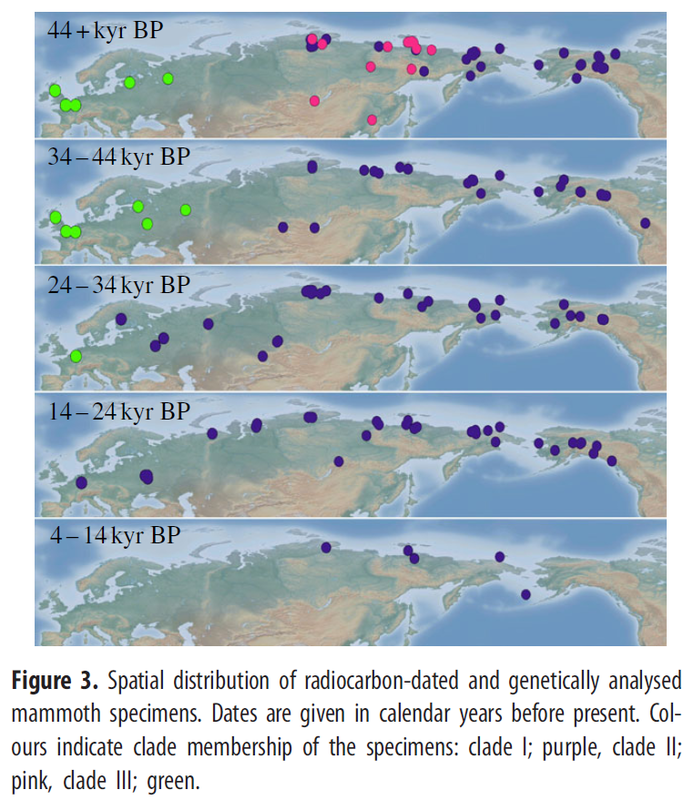 So the mammoth paleogeography does little to explain the presence of R1b1 in Mediterranean post-LGM Europe. If out of 11 catalunha sample only one is r1b then the all r1b to bell beaker link is finished. Done. Even if samples from portugal, spain and france are not 80% plus r1b...then something needs to be revised. @BBblogger: The first article relates to Vestonice and Southern Poland, where Gravettian people 30kya indeed appear to have had quite a mammoth hunter tradition (18% of all bones recovered). As the Eastern European mammoths are assumed to have died out 34 kya, with subsequent repopulation from Beringian ones, the mammoth hunter secenario would imply that Vestonice was already characterised by population inflow from further east. As for Afontova Gora, Igmayka explains on Anthrogenica that "His Q is very odd, according to those who have decoded his Y-SNP calls. Genetiker classifies him as Q-F1215. YFull calls that same level Q-F1096. And sure enough, the first entry in that clade is AF2, classified specifically as Q-F746*. But look at its neighbors. Saqqaq also belongs to the Q-F746 clade, as does a Peruvian and two Vietnamese research samples. The direct sibling of Q-F746 is the well-known Q-M25 clade, which splits into the European Q-YP1669 and the West Eurasian Q-L712." Gravetto-Danubian argues that "On the contrary, the 'new' gene flow into Villabruna cluster appears to have been a west Eurasian lineage, unrelated to ANE/ Malta types, probably stemming from around the Black Sea- Balkans- Anatolia region (and by 'new', we mean yet un-sampled groups from EE & the Balkans)". I find it very well founded. M269 being in a Bell Beaker doesn't mean anything. They have to be under L23, or we know they descend from an Eastern European group of m269. Considering WHG is 20k years of additional drift from ANE, the equal Dstats indicate a high probability of ANE in WHG, which would also explain the stats of being closer to Asians and Native Americans than UP samples. I'm going to work on the phylogeny soon. I believe WHG to be a mix of UP, later Balkan and West Asian groups, and ANE as well. "I reckon maybe one R1b, and possibly not M269 at that." Are you suggesting that the people who became Bell Beakers did not originally come from the Steppe? I read Paglicci71 has less than 4000 SNP's. That renders it useless. Would it be possible to still use it in D-stats with the thought in the back of our minds that we actually haven't proven anything yet? Or are their limitations in the software to prevent that? You right. I even dare to say, either already P310 or it means nothing to my theory. At least they must be loaded up with L51. Does it make sense to you? They have to be at least L51 to kind of be important. P312 already existed at the start of Bell Beaker. I'm still banking on Ukraine or very close by. There's a lot of branches of p312 that aren't close to Iberia. An origin near Western Europe looks impossible. You will be hard pressed to argue against m269, L23*, and Z2103/5 in Yamnaya, with an Eastern origin. I might be wrong, obviously. I” Wasn’t there”… But. With some lenience from everybody I would say the following. a.Up Until 5,500BC it was M269 when “my Shulaveri” started to be kicked out by J2 Ubaid as a black cloud. "You will be hard pressed to argue against m269, L23*, and Z2103/5 in Yamnaya"
. If I am correct, yes. L23 stood behind. L51 would be Nile Delta born(or tel Tsaf in Jordan valley).
. Lots of M269/L23 flee over also over the Caucasus Mountains to the other side (by 4.900 BC it was a leveling Armageddon event from those Ubaid/Uruk)and them became Maykop and part of later Yamnaya and so forth making the Z2103 clade. Steppe R1b? – Just those Z2103. Before maykop even Uruk (j2) manage to cross to the other side of the moutains and had a presence there! That is how Badass those guys were. See Dnieper–Donets culture, turning Maykop and later turning Yamnaya was loaded with fleeing r1b- L23 (my Shulaveri) mixing with some J2 from Uruk period and later R1a from a bit north Comb Ceramic Culture. 1) This scenario is incomplete, as it does not explain R2 in South Asia, or how P1 got to the Steppe to begin with. That being said, I do think explanations for those will be found eventually. 2) If Villabruna is a combination of CHG and Siberian mammoth hunters, I don't think we can exclude CHG as a source of R1b in Villabruna, as we know CHG had their own steppe ancestry too. I don't think it's the most likely case, but I don't think it can be ruled out either. 3) This scenario would support Eastern Europe as a sink for the same migration that brought R1b to Villabruna, with a source lying somewhere further East on the Steppe. @ Davidski, thanks. The f4 ratios with Kostenki14 and GoyetQ116-1 function OK as a sensor of West Eurasian clade ancestry, by the look of it. While the ones with Oase1 don't really function as much of anything since the Eurasian pop stat is so weak compared to the Mbuti stat. Appears to indicate MA1 is closer to Kostenki14 and GoyetQ116-1 than AfontovaGora3 (MA1's f4 stat is relatively more similar to the relatedness of GoyetQ116-1 and Kostenki14 to one another). Indicates that Satsurblia is non-significantly marginally further from GoyetQ116-1 than Ust_Ishim is. "Appears to indicate MA1 is closer to Kostenki14 and GoyetQ116-1 than AfontovaGora3 "
Maybe AG3 was already becoming slightly admixted with East-Asians? American-Indians are clearly Han admixted, and they are considered to have been separated from Eurasia 17.000-15.000 ya. AG3 is AfontovaGora3 16,930-16,490 years old. Just like Motala has a trace of ANE, EHG has a lot and Mal'ta *is* ANE the amount of East-Asian admixture in ANE around 16.000 ya could have been climbing the more eastward one looked. There is no gene flow between Villabruna and AG3 to the exclusion of MA1. Also to note that AG3 does not form a clade with AG2 to the exclusion of MA1, but the 3 of them for a clade to the exclusion of UP Europeans. Seem to make it clear that such increase in affinity is not mediated by AG3 possible admixture. Maybe AG3 was already becoming slightly admixed with East-Asians? Chimp Mbuti Hungary_HG Vestonice16 -0.017 -3.736"
This may even be an artifact. But then someone needs to explain how. Whg's should have ANE admixture. If they didn't, they would be further from ANE due to the UP being closer to the split of West Eurasians. The even stat means they don't have 20-25k years of drift away from ANE, but enough to make it even. If you do a direct comparison, Mbuti Villabruna Kostenki14 AG3, the Z-score is significant towards UP, but not extreme in the f4. It's not specific to ANE. WHGs are also closer to East Asians that split even earlier. And to Oceanians too. And apparently, even to Africans. I don't really know why. Is it the Neanderthal effect in pre-LGM Europeans? Or something else? But whatever it is, the stats don't support that it's something specifically related to ANE. Nor does the paper itself support that idea. Those D-stats will take a while. I wasn't suggesting that the Villabruna cluster people hunted mammoths. What I was suggesting was that the Villabruna clade eventually formed after mammoth hunters had infiltrated Central Europe and settled among post-Ice Age Europeans. Thanks for the link. Gravettians from the east? No point trying to run D-stats on less than 10K SNPs. Interestingly, both Villabruna man and Satsurblia are Epigravettians. Gravettians: the earliest sites are from places like Willndorf, Vestonice & Pavlov, ie (east-)central Europe. Russian Gravettian sites appear to be small sub-section, and the overall phenomenon appears to be polycentric with localised adaptations to changing conditions moving into the LGM. Genetically, our current sample set appears to be just a more western version of Kostenki, which was already present since 36 kya. So there is no evidence for Gravettians being from the east, although from a western European perspective, they are slightly east -shifted. Similarly, "Epi-Gravettian' is a catch all term for areas of southern Europe, the Black Sea and Caucasus where there is a less abrupt techno-typological shift in response to changing climate c.f. the Magdalenian parts of Europe (i.e. the YD and oscillations around it). An Epi-Gravettian Italy could be very different to that in Ukraine and again still to Georgia. "So the mammoth paleogeography does little to explain the presence of R1b1 in Mediterranean post-LGM Europe." It wouldn't explain it at all if they were all R1b - but it might explain why only one of them was (and why some of them had east asian admixture if it was the steppe component who brought that). "And then again, Villabruna types are closer to everyone than pre-LGM Europeans are, but most of all to West Asians and by extension probably North Africans. Hell, they're even closer to SSA too by these other stats (whatever that means)"
I'd think a simple resolution to this would be a two-wave out of Africa model, with, with pre-LGM having a relatively large contribution from the first wave compared to all other populations. I think the uniparental markers back that up too really. Also, I wonder if there's any special relationship between pre-LGM Europeans and the modern human admixture in Altai Neanderthals. On the "follow the mammoths" theory - I think the mitochondrial DNA is pretty good evidence in its favour too. It's a good explanation for haplogroups C1 and C4 showing up in Eastern Europe. I'll be posting a couple of D-stats sheets for nMonte/4Mix with the new UP samples later today. Let's see if we can solve this puzzle. As a what if - if there were a population adapted to living off mammoth in a northern strip what options would they have once they ate them all? and looking at the maps in the OP this may have happened multiple times although the last time would only have options (1) or (2). option 1) stay put -> change in tools? option 2) drift south -> Villabruna? "The paper explicitly states that there was no East Asian admixure in Villabruna"
Ah, i thought i read there was some in some samples but not others? Must have misread it - apols. "We observe an affinity to Near Easterners beginning with the Villabruna Cluster, and another to east Asians that affects a subset of the Villabruna Cluster." Fair enough, important to be accurate. Which is what Grey said before you 'corrected' him. "why some of them had east asian admixture"
Just trying to keep things clear here. showing a greater affinity between early UP Europeans and MA1 than with early UP Europeans and AG3. AG3 just has less affinity to UP Europeans. (Some gene flow between MA1 and early UP Europeans that isn't shared by AG3's ancestors?). because MA1 isn't involved in any of them. Why does a lower affinity between AG3 and early UP Europeans relative to MA1, explain a greater affinity of late UP Europeans to AG3 relative to early UP Europeans? With a model of gene flow between MA1 and early UP Europeans, then no gene flow between the ancestors of late UP Villabruna and MA1, I can't see how that explains late UP Villabruna being closer to AG3 than early UP are. Probably in which journal, the new BBC genome is going to be published?. I know that there's a major paper about Bell Beaker origins on the way sometime this year, which is not a secret, but as far as I know, it won't be out for a while. The Authors told you so?. This here study will probably come out this year. But certainly not soon, as in, not within a few weeks. Matt, I simply think that if P developed in the east, as it should, it was originally native American like and lacked all near eastern admixture and was therefore ANE/ENA like. Then after Q-R split, R moved westward and south and developed y lines that still exist, such as R1 and R2. This happened maybe between 30 and 20 kya. Successful Q lines instead remained in the east. Upper Palaeolithic Europeans are closer to Ma1 because he was more western (we know that he carried mtDNA U as most upper Palaeolithic Europeans), and Afontova Gora was more northeastern and Native American like (e.g. mtDNA R1b which could be related to mtDNA B). Then, during the late Paleolithic there were these successful microblade cultures that made their way from Northeast Asia towards Europe and that made late Palaeolithic Europeans more Native American / ENA like. Of course this is the best explanation about what happened, thus also at a linguistic point of view we should think that these R1b1* (very likely both R-V88, R-M335 and L389+) brought a language of a Nostratic stock but closer linked to the Ugro-Finnic ones. Perhaps you know that, amongst what I said out of what all the others thought, there was also the origin of the Indo-European languages in the "Italian Refugium". We have to see when the separation between R1a and R1b happened, but they may have lived in the same place for so long, and the separation between centum IE and satem IE may have happened then, when R1a and R1b developed in different places of Europe, R1a northward and R1b southward. The short ages given from academic linguists are wrong, I think. Of course during all these millennia many facts happened, i.e. many influences that all these groups exercited amongst themselves, but just looking at a previous post of yours about the origin of Sumerian language (I read the interesting paper of Sahala 2009), we cannot disjoin from the series of PIE *kwekwlo- also Etruscan "puplu", our word for "people" through Latin "populus". Rhaetian-Etruscan formed in the Alpine Region and is intermediate between a Caucasian stock and an Indo-European one (this was the thought of Alfredo Trombetti). I think BB was not a 'monoethnic' phenomena. It will have substructures. Creators of culture can be different people from the spreaders or rulers. There are many such cases in history. Btw as far as I know Chalcholitic_Iberia samples technically fits into BB period but they have 0% R1b. Imho R1b was intrusive element for BB, but of course R1b folk developed it to new higher degree. because MA1 isn't involved in any of them. Right. So these stats we don't know the exact reason for them, but we do know that it's not an ANE specific phenomenon. Basically if you substitute AG3 in those stats for any post-20,000 BP sample (including all moderns) you'll get comparable results (the more west Eurasian the more significant, but also with East Asians you'll get a +ve result. Apparently even with Mbuti itself, when you introduce Chimp as an outgroup). I checked where Malta and Afontova Gora are located on the map. Malta is to the west of the Lake Baikal and not very far from the Mongolian Steppe while Afontova Gora is deeper in the forest further north on Yenisei River. Malta is located more to the east than Afontova Gora. However, it is interesting to note that still today people in Altai are more western and have much more western admixture than people up on Yenisei River who always seem to have been more Native American/Beringian like. Gioiello, yes, the languages in the Eurasian heartland share a huge amount of vocabulary and grammatical traits and, IMO, much of it probably predates IE and Uralic and even Nostratic level. R1a and R1b split goes very far back in time so, I would not dare to say that IE languages existed at that time. However, I am now in favour of a more western location for IE languages than before, and I exclude Altai and do not support Siberia as an IE home area. I think that if we ever can imagine the languages spoken by Malta boy and Afontova Gora people, they were more Native American than modern Eurasian like. If we apply strict sense in dating, its hard to imagine that PIE existed before the 3000 BC period! . Stay rest assured that the R1b of Italy had nothing to do with IE!. In sense of Farming-herding theory , we can date PIE before 6000 BC, but I know, not many of you will support that suggestion. Kristiina, of course I agree with you that, whether we may presuppose all that said above and Villabruna spoke some sort of Nostratic, that couldn't be Indo-European, but I think we shouldn't exclude that the R-L23 (if it will be demonstrated that they reached Samara from West: Italian Refugium or nearby) spoke some sort of pre-satem IE. Wa‫sn't me to say that the country with the most varied presence of Indo-European different languages was Italy, but Mallory and Adams. I think that we shouldn't put any limit to hypotheses, but only pretend that each hypothesis is demonstrated. Of course a first answer will come from next aDNA, from which we'll get a more careful picture about the diffusion of hg. R1b1 and subclades. If you are implying that SNP's are first hand to resolve Linguistic theories, then I am afraid that it is ridiculous . As the supreme authority in linguistic matters goes to Ancient Scripts always . Genetics will always play the secondary role . Nirjhar007, I have no desire to polemize with you. So far were you and your similar to snob me, but R1b1 14000 years old has been found so far in Italy and not in India. Beyond that we are so far: you think in Sanskrit and me in Latin. I think I have anything to learn from you about linguistics, genetics and many other things. As we have no written document about more than 4000 years ago as to Indo-European languages (and there is no hope in finding that), genetics and the reconstruction of the pathway of the haplogroups may help us, of course also this time someone of us will be the winner and all the others the losers. It is ridiculous to say that SNP's will construct linguistic history. Exactly , all the oldest sources from Veda, Avesta, Liner B and Hittite texts etc all fall around that 2000 BC period. The reconstruction from data taken from those ancient texts to which we know ''PIE'' is already quite close to the specific dialects! I remember A commentator named Mike Thomas already pointed this before . So, at best from that 2000 BC period we may push back another 1000 years for the proto language , but before that its all fade and wayward . And saying that R1a and R1b reflects the Centum-Satem divide is plain hogwash and beyond madness. The paper confirm that there was two various kinds of Siberian mamoths along with one third kind in Europe, onto to the LGM. During the long cold 23-18.000 BP the European mamoth died out, along with most Eurasian populations of larger mammals, humans included. The more sturdy Siberian survived though, by wandering west, towards the milder climate of the Atlantean facade, where it survived until the shorter but deeper cold of the Younger Dryas, between 13. and 12.000 BP. During the same period (YD) the last populations of some 15 other large mammals died out too - after more than 120.000 years of sucession in the paleolithic environment of western and northern Eurasia. A number of arctically adapted land-animals were obviously able to survive this worst and terminal part of ice-time, though - due to a few but effective climatical refugia, where the "continous winter" of Younger Dryas were suvivable. Among the arctically adapted mammals that where able to survive the YD were a groups of human beings, from where the western and northern Eurasia were re-populated. Thus we can understand from which time-period the genetic bottle-neck in the human genome, occured. The close relationship between the biotopes of arctic human and (other) arctic mammals are of obvious significance to our understanding of the human journey throughout Eurasian paleolithic. There is already a well-known relationship between reindeers and humans during the late paleolithic and early mesolithic. Thus a similar investigation of the Eurasian reindeer may be more close and significant than the relationship between humans and mammoths. the western and milder part of Eurasia was turned into barren steppes and unhabbitable taiga. Thus we know that the species that survived ice-time are a result of known refugias, registered during the fatal millenia of the Younger Dryas, rather than the previous and milder LGM. Thus we have to explain the genetic construct of the present Eurasian mammals, we have to account for the Younger Dryas (and NOT the LGM) as the real, historical bottle-neck of the Eurasian genome - which apparently stems from a very limited group of (highly) adpeted (arctical) humans. Thus we have to consider the post-Dryas populations, occuring 12.000 years ago, as the stem of the 'caucasoid' makrogroup (like y-dna CF) that later came to branch out as the artic and semi-arctic climate-zones got re-populated. Some of them obviously mixed with the tropical populations that survived LGM/YD in China, SE Asia, S Asia, Africa and S America. Today a number of linguistical theories are discussing a paleolithic continuation of the proto-IE and proto-Uralian languages. Thus we may find a correspondance between the origin and re-branching of todays y-dna F (G-K) and the origin and spread of the Indo-European and Uralian languages. Sincerely. I assume I know nothing like John Snow… but if its proven at some point that… Yes, Pie language is a late coming, and this conundrums that we are here talking about is related to the fact that for people prior to PIE language were communicating in a Nostratic language, at least in southern and southwest Europe, which is clearly seen as Tartessian languge in southern Iberia, or nowadays basque language, and even some Berber North Africa ancient languages (like the Siwa in Egypt oasis), then for sure a lot of people that I like many other think are smart people (I mean entire fields of investigation) I will just make a point of telling them how dumb they are. Really. Because in the depths of my ignorance its really pretty obvious. As it is the fact that Those same Language were the hallmark of R1b coalescence in Iberia (where Tartassian and Basque stood) or Villanovan and Etruscan languages were just a bit later in time. Where/when did that migration out from the Italian refugee happen? It makes no sense. By 3800BC (for instance) Iberia little more had then 3 guys and a goat. It really was spaced apart. So much that two girls separated by almost 2,000 years were actually family related (like in Western Portugal). By 3000BC , Porto Torrão in Alentejo, was 500 HA big! That is bigger than the UR city in Mesopotamia. Join to the pack Perdigoes (a couple miles away) with 70Ha, or just a 100 mile radius around it you have several “cities” between 50Ha and 100ha. That is well over hundreds of thousands people. Where do you think that people were in Italia refugee? These people are the genetic makeshift of Iberia and North Italy (at least). There's no such thing as Nostratic, unless we lose the very basis to the Comparative Method and see evidence where there is none. That would shutdown a lot of world inferences, no? Cant we say that nostratic are the languages that we can not directly relate to just being a product of Afro-Asiatic, Kartevelian, Dradivian and euroasiatic, but still are of the same family? Allowing us to link, with this name, also linguistic events Such as Basque, Tartessian, Hausa, Tamazigh,Beja, Akkadian? Cant it be called a Nostratic substratum? I mean they are the languages left by R1b route trough North africa (kidding!) onto Iberia. 1) Was the Villabruna family the only one in those times or there were many others and where? 2) Will be some R1b1 found in aDNA of Northern Africa, Middle East or Southern Asia? 3) Did the R-L23 found at Samara come from Italy or from elsewhere and when? 4) The same for R1a. 5) Between R-M207 and R-L278 there are (as to Yfull but I think that they are more) 48 SNPs. 6) R-V88 came out after 75 SNPs. 7) R-P297 came out after 54 SNPs. 8) R-M269 came out after 82 SNPs. I think that also a child understands that it isn't a matter of numbers but of bottom (we'd say in Italy). 1) During the ice age and later mammoths were predated at higher rates in europe than in siberia and north america. do wild horses show a similar trend? "Cant we say that nostratic are the languages that we can not directly relate to just being a product of Afro-Asiatic, Kartevelian, Dradivian and euroasiatic, but still are of the same family? I mean they are the languages left by R1b route trough North africa (kidding!) onto Iberia." No, there is no evidence that PIE or AA are the product of filiation from a common language. No serious scholar thinks that. But lets put aside the problematic methods of Nostraticists pointed out ad nauseum by regular linguists, for it to gel with your theory, you'd need the Common Ancestor of IE and AA to have exsited as late as 7000 BC (ie the time R1b left the Middle East and headed west via Africa then to Iberia). Again, no one is going to believe that AA and PIE were sibling branches as late as 7 - 6000 BC. For any stretch of possibility of common filiation, you'd need to go back to Epipalaeothic and beyond. But, of course, back then there'd be no even pre-PIE, and indeed, the entire linear inheritance pattern collapses due to horizontal transmission, discontinuities, language extinctions, etc; and would entirely misunderstand the fundamentals of language genesis. So, sorry to say, but it sounds like your theory needs Nostratic to survive. Just like it needs the dubious assumption that you can track back languages 10, 000 years back by simply following a Y haplogroup - this case R1b. Instead of choosing a hypothesis and looking for evidence to support it, shouldn't we operate vice-versa ? Could you make Excel table of the Z-scores of D-statistics D(MButi, X; Y, Z) where X, Y, Z are Karelia_HG, Samara_HG, AfontovaGora3, AfontovaGora2, MA1, Karitiana, Villabruna, ElMiron, GoyetQ116-1, GoyetQ2, Kostenki14, Vestonice, Paglicci133, Loschbour, Anatolia_Neolithic, Kotias, Satsurblia, Hungarian.KO1, Han, Yoruba, Kalash, Oase1, Ust_Ishim. So no brackets or commas, and the pop IDs should be based on the sheets I posted above. However, What I am Saying is that: Basque (a sort of) is a language that was spoke the R1b coming out of the Caucasus to Iberia. So was Tartessian. And Siwa Oasis language or Tamazigh. No the whole AA or Dradivian, right?. What I am looking is for a correlation of a kind for those languages, not the whole substratum. Here you, but I'd say you might get more insights using the new D-stats and nMonte that I posted in the new thread. It strikes me that Mal'ta is pre-LGM and AG3 post-LGM. Villabruna likes everything post-LGM over pre-LGM. 1) Papers came out recently talking about 3 big groups that mixed into European genetics. The first hunter gatherers into Europe around 50kBC, the middle eastern farmers with A111T and "white" skin, and the third group that came into Europe around 5000 years ago or right at the beginning of the bronze age. Now the third group was suppose to be from the Ukraine/Russia area i thought and are apparently related to the same group of people who went into America 6k years before that-- Could this third mystery group be PIE? Why or why not? 3) You guys keep talking about Z93, can you link me to a something that would explain that? 4) Horse DNA. I heard something about horse remains in kazakhstan (sp? sorry) providing DNA that shows that all domesticated horses originated from kazakhstan? What do you know about this? 5) Why do some linguists hate the Kurgan hypothesis and keep pushing for Anatolia as PIE homeland? Thanks much! Sorry about the amateur questions, this isnt my field obviously. Can you explain 3 things for me? I don;t know too much about Basque. Papers came out recently talking about 3 big groups that mixed into European genetics. Modern Europeans are primarily the descendants of four groups: Anatolian Neolithic farmers, Western European Hunter-Gatherers (WHG), Caucasus Hunter-Gatherers (CHG) and Eastern European Hunter-Gatherers (EHG). Markers for light skin are found among the Anatolian farmers, CHG and EHG. Markers for blue eyes are found among WHG, CHG and EHG. None of these groups are from South Asia, or have any South Asian ancestry at least as far back as the Ice Age. So there goes any Out of India hypothesis, for the origins of Europeans or Proto-Indo-Europeans. The Americas were settled around 12-15,000 years ago by people related East Asians and EHG. So this isn't relevant to the spread of Proto-Indo-European (PIE), and even if it was, clearly it has nothing to do with South Asia. You guys keep talking about Z93, can you link me to a something that would explain that? Horse DNA. I heard something about horse remains in kazakhstan (sp? sorry) providing DNA that shows that all domesticated horses originated from kazakhstan? What do you know about this? I don't know much about horse DNA, but the Kazakh steppe isn't very far from Eastern Europe. Why do some linguists hate the Kurgan hypothesis and keep pushing for Anatolia as PIE homeland? Probably because they're left wing loonies who are motivated by politics to prove that anything useful and/or influential cannot be of European origin. They believe that shitting on anything European, as well as singing Kumbaya My Lord, will result in a utopia where there's no racism or indeed any hate. These people are total morons and should be locked up in rooms with pillows for walls. Could you make D-statistics from https://drive.google.com/open?id=0B0yK84t1ByXGVzY2X0tGU052VFU ? On another more serious note: The two Paglicci genomes that would have been extremely interesting are both less than 10.000 SNPs. Paglicci108 is not used, Paglicci71 even has less then 4.000 SNPs. They differ 9.000 years in age. Would it be sensible to combine both genomes and see if they add up to more than 10.000 SNPs? And if they show affinity to Villabruna? Both specimen are attributed to an Epigravettian culture in the paper. Paglicci108 is not Epigravettian. My bad. Too many stats. I don't have time to run them. I can only run up to 30 stats per request.